Work to increase city funding for bikes from 0.1% of General Fund to 0.9% of General Fund to reflect existing bike mode share. Bike infrastructure, especially good quality bike infrastructure costs money and we’re going to advocate to increase funding in the City’s budget. First, the good news: in this year’s adopted budget, 3% of the city’s transportation budget will be spent on bikes. Second, we need to dig deeper and learn more about what we uncovered. Montreal’s cycle tracks attract 2.5 times as many cyclists as comparable streets with no bike lane, and have lower injury rates, a new study shows. Our board approved this goal last year based on the concept of induced demand. Induced demand also applies to bicycle facilities and within bike advocacy circles this translates into “build it and they will come“. In retrospect, the original goal as listed was a bit imprecise; for example, there was no need to base the amount off of the General Fund instead of the Transportation Department’s budget. However, this gave us an opportunity to learn about the complexity of bicycle facility funding. In 2011, 0.9% of San Diegans (now 1.1%) were commuting by bicycle. We wanted to see a matching percentage of dedicated funding devoted to bicycle facilities and for that percentage to grow to facilitate bicycle ridership in the city. We can see this correlation in other cities that have prioritized bicycling as a mode of transportation. 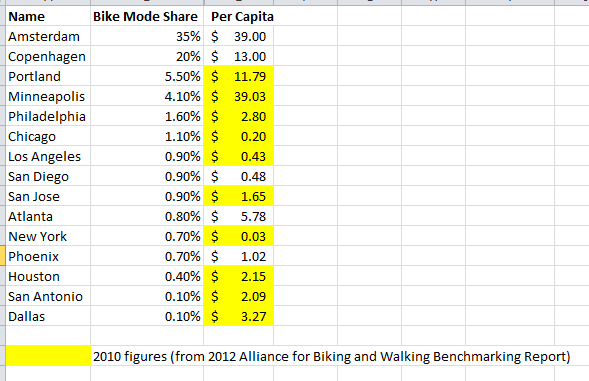 A more useful metric is per capita spending on bicycle facilities. We’ve been working towards the goal of $39 per capita to meet the Danish and Dutch funding reality. These two nations have figured out how to move nearly 50% of their population by bicycle in their largest cities. What is being spent in San Diego? In the city of San Diego a single bicycle facility can be built with funding from the city, the region (SANDAG), the state and/or the federal government. Tracking these numbers down has been a painful process, so we decided to start with the city. Where does a tiny little organization even start? We started by making strategic alliances. In this case, I’m proud to state that we joined forces with the Center on Policy Initiatives (CPI) who created the Community Budget Alliance (CBA) – an alliance of over 40 organizations formed two years ago to advocate for a fair, equitable and transparent budget. When the former mayor released his draft budget earlier this year to the public for input, we worked with the CBA to dissect the budget. Bicycle facilities can be both capital improvement projects (like the Mike Gotch bicycle/pedestrian bridge) or service-related projects (such as sharrows, bike route signs or the new buffered bike lanes being striped alongside the ongoing resurfacing efforts). It’s almost overwhelming to envision the facilities that need to be built in order to become a world-class bicycling city. However, in the last year we have focused on some of the deficiencies in the city, such as the deadly freeway on-ramps and off-ramps that are found in nearly every community. Freeway on-ramp redesigns would fall under the realm of a capital improvement project and since these facilities fall under the jurisdiction of two or more agencies (in this case, the city of San Diego and Caltrans), agency coordination is absolutely critical. I was asked to contact you about getting some detail from the mayor’s proposed budget. Since bicycle infrastructure comes under the umbrella of both capital improvement projects (assets) as well as service related projects – I find it an incredible challenge to break down what actually is being allocated toward bike projects in the city budget. Is there a way for you to send me that information and perhaps make it easier to find within the budget documents? Sam, what I am familiar with and am working on is the CIP annual allocation projects I discussed at our last meeting regarding this issue. That is identified in the CIP Section of the budget. Minor bike facilities, $639,000: this includes sharrows, signs, bike lanes, and facilities that can be built based on traffic service requests. Bicycle Program Manager, $120,744: This position was held by Ed Clancy, but according to Marabian this position was “reabsorbed” into the department after Clancy’s resignation. This council-approved position has been vacant for months and, despite our letter to Interim Mayor Gloria, has not been filled. We are at-risk of losing our hard-fought momentum. With the elimination of Clancy’s position, the city is spending $989,000 on bikes. City funds are not the only funds that are used to build bicycle facilities. SANDAG also provides funds via Transnet. How much was SANDAG allocating to the city of San Diego? While browsing the Independent Taxpayer Oversight Committee report on Transnet expenditures, I found that the city seemed to be sitting on about $54 million. Could these funds be spent on bicycle facilities? I asked Marabian how the city determined its Transnet spending priorities and she responded that Council Policy 800-14 determines the prioritization factor. to guide the Mayor’s Capital Improvement Program Review and Advisory Committee (CIPRAC) in its CIP deliberations. The goal of this policy is to establish a capital-planning process that ultimately leads to policy decisions that optimize the use of available resources for projects competing from the same fund source or multiple fund sources. reduction in accidents, main breaks, sewer spills and flooding problems. promote community walk-ability and use of bicycles or public transit. Our input had two main points: account for the fact that some assets can have multiple owners (such as the on-ramps mentioned above), and recognize that the biggest return on investment (especially for bicycle facilities) would be had in areas of high population density like the urban core communities in Mid-City. Last night, our city council unanimously approved the policy (with Council President Gloria absent). Although we joined in at the tail end of updating this policy document we’re glad to have been a part of this historic moment. The newly-strengthened council policy will ensure that our second year of advocacy will be more deliberate and informed by policies to strengthen our advocacy efforts. Thank you to all our members who showed up in support!